Jack is used to danger. His asthma has nearly killed him more than once. But his new home has a danger he’s never known before — the spirits of the dead. But in Jack’s house, they can chase, hide, scream. I may be one of the biggest scaredy-cats in the world, or at least, among my group of friends. I know this doesn’t make sense when it comes to my love for all things zombie. I like all the shambling, brain-moaning creatures, but when it comes to ghosts and other supernatural stuff? I cower under my covers. When I was a kid I used to like scaring myself silly by watching those Halloween specials that all local TV shows air during those times and no fail, I always end up being too scared to sleep for at least a week after watching those shows. I finally got to the point where I told myself to stop — no more scary TV shows, no more scary anything, especially if I will lose sleep over it! So to be totally honest, I was kind of apprehensive with my Required Reading challenge for October, given my state of being a chicken. :P But of course, what is a challenge if you don’t challenge yourself, right? The thing that really got me to buy Breathe by Cliff McNish is the fact that the main character, Jack, has asthma. I’m an asthmatic, too, so reading about characters who have the same condition brings me comfort because I could relate to them1. Jack’s asthma attacks seem to be more dangerous than the ones I’ve been having lately, though, bad enough to almost kill him. It doesn’t help that his dad recently passed away. In an effort to stop him from stressing out or getting lonely, Jack and his mom moved out and into an old farmhouse, where they hope to find peace and quiet. But instead of finding peace and quiet, they find something else. Little did they know that the farmhouse was haunted by four ghosts, all children, whose spirits can’t seem to leave the house Jack finds that he has the ability to sense who had lived in the house before, and to the ghost children’s surprise, he could actually see them. This makes Jack extremely curious to the point of triggering his asthma, but then he discovers that there is something more sinister living in the house, and only he has the power to save himself and his mother. Like I said, I’m a big scaredy-cat, so I made it a point to read Breathe in broad daylight. The first few chapters of the book were creepy and the illustrations at the start of each chapter gave my imagination enough fuel to see practically the entire chapter. McNish’s writing is very vivid — it was easy to slip into the world he created and actually see the house and the characters. I admit to being spooked for the first few chapters (but then again, it may be just because I’m easily frightened), but I grew comfortable with it later on. Jack’s asthma attacks were also very accurate — and also really scary, in the actual physical sense because I know I could also experience something like that. The extreme measures he and his mom had to go through just to make sure his lungs would behave is something akin to what my mom used to do when I was younger. I’m really, really hoping my asthma won’t escalate to anything similar. You know now that I think about it, it’s not really that scary. However, I think I can attribute that to the fact that the story is really quite linear. Somewhere early into the book, we already know who the real villain is, and a little bit of why. The other reasons and the story were gradually revealed, but by then it feels almost like a typical ghost story. While I’d really rather not read ghost stories, I still want for a twist that will leave my mouth hanging open in the end, at least to thrill the reader in me. 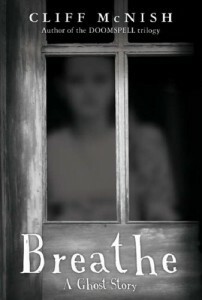 Breathe by Cliff McNish may not fare so much with people who really love ghost stories (or who take delight in being scared), but for a casual reader (or for someone who doesn’t really like getting scared), it’s a pretty good novel. The first aid lessons for an asthma attack are a plus, too. This is my first Cliff McNish, but I think it won’t be my last. Now, are his other books scary, too?